Alachua County (/əˈlætʃu.ə/ a-LATCH-oo-a) is a county in the U.S. state of Florida. As of the 2010 census, the population was 247,336. The county seat is Gainesville, the home of the University of Florida. The first people known to have entered the area of Alachua County were Paleo-Indians, who left artifacts in the Santa Fe River basin prior to 8000 BCE. Artifacts from the Archaic period (8000 - 2000 BCE) have been found at several sites in Alachua County. Permanent settlements appeared in what is now Alachua County around 100 CE, as people of the wide-ranging Deptford culture developed the local Cades Pond culture. The Cades Pond culture gave way to the Alachua culture around 600 CE. The Timucua-speaking Potanos lived in the Alachua culture area in the 16th century, when the Spanish entered Florida. The Potano were incorporated in the Spanish mission system, but disease, rebellion, and raids by tribes backed by the English led to severe population declines and the depopulation of what is now Alachua County by the early 18th century. In the 17th century Francisco Menéndez Márquez, Royal Treasurer for Spanish Florida, established the La Chua ranch on the northern side of what is now known as Payne's Prairie, on a bluff overlooking the Alachua Sink. Lieutenant Diego Peña, who traveled across northern Florida in 1716, reported passing by springs named Aquilachua, Usichua, Usiparachua, and Afanochua. Assuming the named springs were in fact sinkholes suggests "chua" was the Timucua word for "sinkhole". Around 1740 a band of Oconee people led by Ahaya, who was called "Cowkeeper" by the English, settled on what is now Payne's Prairie. The various Native American people moving into Florida at this time, primarily Muscogee (called "Creek" by the English), were becoming known as "Seminoles", and Ahaya's band became known as the Alachua Seminoles. In 1774 William Bartram visited Ahaya's town, Cuscowilla, near what Bartram called the Alachua Savanna. King Payne, who succeeded Ahaya as chief of the Alachua Seminoles, established a new town known as Payne's Town. In 1812, during an attempt by American adventurers to seize Spanish Florida, a force of over 100 volunteers from Georgia led by Colonel Daniel Newnan ran into a band of Alachua Seminoles led by King Payne near Newnans Lake. After several days of intermittent fighting, Colonel Newnan's force withdrew. King Payne was wounded in the fight and died two months later. The Alachua Seminoles left Payne's Town and moved further west and south, but other bands of Seminoles moved in. A second American expedition in 1813 killed many of these Seminoles and burned every Seminole village they could find in the area. In 1814 a group of more than 100 American settlers moved to a point believed to be near the abandoned Payne's Town (near Micanopy) and declared the establishment of the District of Elotchaway of the Republic of East Florida. The settlement collapsed a few months later after its leader, Colonel Buckner Harris, was killed by Seminoles, and the settlers returned to Georgia. In 1817 F. M. Arredondo received the 20-mile square Arredondo Grant in the southern part of what is Alachua County. By the time Florida was formally transferred from Spain to the United States, people from the United States and from Europe were settling in the area. Wanton's Store, near the site of the abandoned King Payne's Town, attracted settlers, primarily from Europe, who founded Micanopy. The 1823 Treaty of Moultrie Creek required the Seminoles to move a reservation south of what is now Ocala, and the flow of settlers into the area increased. Many occupied former Seminole towns, such as Hogtown. Alachua County was created by the Florida territorial legislature in 1824. The new county stretched from the border with Georgia south to Charlotte Harbor. The original county seat was Wanton's (the name Micanopy had not been adopted, yet). In 1828 the county seat was moved to Newnansville located near the current site of the city of Alachua. Alachua County was soon reduced in size. In 1832 the county's northern part, including Newnansville, was separated to create Columbia County, forcing the county seat to be moved to various temporary locations. In 1834 Hillsborough County, including the area around Tampa Bay down to Charlotte Harbor, was created. In 1839 that part of Columbia County south of the Santa Fe River was returned to Alachua County, and Newnansville was restored as the county seat. Hernando County was created in 1843 from that part of Alachua County south of the Withlacoochee River, Marion County was created in 1844, and Levy County was created from that part of Alachua County west of the Suwannee River in 1846. It would be another 80 years before Alachua County was again reduced in size. In 1854, the new railroad from Fernandina to Cedar Key bypassed Newnansville and Gainesville, a new town on the railroad, began to draw business and residents away from Newnansville. Gainesville became the new county seat that same year. The Alachua County Library District traces its origins to 1905, when the Twentieth Century Club in Gainesville started a subscription library. The Gainesville Public Library, which was a subscription library operated by the Library Association, opened in 1906. The Twentieth Century Club donated the books from its subscription library, and the new library also received books from the library of the East Florida Seminary, which had been absorbed by the newly founded University of Florida. The Gainesville Public Library became a free library in 1918, supported by funds from city taxes, and in a building constructed with the aid of a Carnegie grant. The library became a department of the City of Gainesville in 1949. A branch of the Gainesville Public Library, the Carver Branch Library, was opened in 1953 to provide library services to the African-American population of Gainesville. The Carver Branch closed in 1969, after the main library had been desegregated. In 1958, the City of Gainesville and Alachua County agreed to jointly operate the library for the whole county. Branch libraries were opened in High springs, Hawthorne and Micanopy the next year, and a bookmobile was put into service. Alachua County joined with Bradford County to operate the Santa Fe Regional Library. 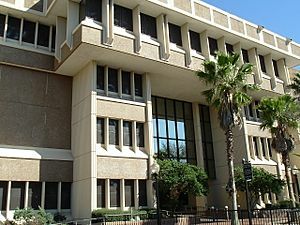 After Bradford County withdrew from the Regional Library, the Alachua County Library District was formally established in 1986. The Millhopper and Tower Road branches opened in 1992, and the branches in Alachua, Archer, Newberry and Waldo were all opened by 1997. The Library Partnership Branch opened in 2009, and the Cone Park Branch in 2011. A new, permanent location for the Cone Park Branch Library was opened near the Eastside Community Center in Gainesville on December 14, 2013. Alachua County, Florida Facts for Kids. Kiddle Encyclopedia.